November is a time of year often associated with the harvest season, when the bounty of our rich agricultural land is celebrated. At Arts Visalia, each of the past four years, we have placed a special emphasis on the work of artists who, through their art, reflect the rich heritage of Tulare County and the region of the Kaweah watershed, the diversity of cultures here, and our deep, agricultural roots. Keeping in this spirit, we are proud to unveil a new body of works in sculpture by Richard Arenas, an artist who has dedicated his entire creative life to the making of art which addresses these very issues. 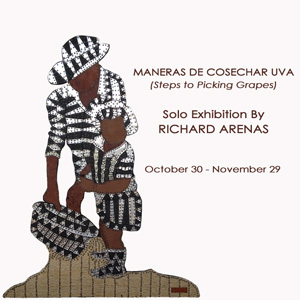 Maneras de Cosechar Uva, as the exhibition is titled, or Steps to Picking Grapes, features a stunning group of a dozen new low-relief sculptures by Arenas, one of Tulare County’s most accomplished and prolific artists. These works represent, in an abstracted and patterned manner, silhouette figures in the physical positions of workers in the field, at labor. The laborious nature of the work behind each piece reflects the very nature of the repetitive and back-breaking work of the farm laborer. Each sculpture is made up of dozens upon dozens of small, handcut pieces of leather, metal and wood, assembled into beautifully patterned figures. These are not protest pieces, nor are they laden with the sentimentality that can often be present in works of homage. These are works full of honesty, familiarity, and reverence. The exhibition runs from October 30th to November 29th. An opening reception will be held on November 1st from 6:00pm to 8:00pm. Admission is free and open to the public.